Public media operates on three mission-driven principles: the creation and distribution of instructional, educational and cultural programming; civil dialogue, civic information and community engagement; and free, reliable, redundant access to potentially life-saving public safety information and alerts. Funding from multiple sources helps Alaska Public Media deliver on those missions through television, radio and a statewide news network. See our latest report to the community on local content and services. Alaska Public Media’s greatest percent of annual funding — 72 percent — comes from the local community of individual donors, corporate partners, foundations and other community partnerships. The second largest funding source is federal support though the Corporation for Public Broadcasting. Seven percent of our funding comes from the State of Alaska. Take Action – Through the Protect My Public Media Action Network. Get Involved – Send an email to Congress about protecting public media. Share – Invite your friends to help by using #ILovePBS and #ILoveNPR. 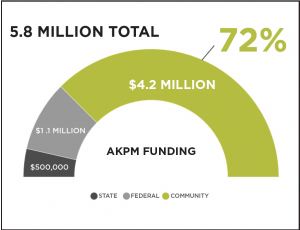 The state investment in Alaska Public Media (AKPM) represents 7 percent of AKPM’s annual budget and costs the state about 54 cents per Alaskan we serve. Funding from the State provides instructional, educational and cultural programming; civil dialogue, civic information and community engagement; and free, reliable, redundant access to potentially life-saving public safety information and alerts. The Alaskan Emergency Alert System (EAS) is governed by a State EAS Plan for public information in the case of an emergency. PBS-AWARN provides a redundant path between the Federal Emergency Management Agency (FEMA) ensuring Wireless Emergency Alerts (WEA) availability to any cellular service provider. EAS and PBS-AWARN are vital public safety information services of which Alaska Public Media is a primary provider. Public radio stations represent 11 out of the State EAS Plan’s 22 “Local Primary Stations,” which are the primary source of EAS information in their region. All 11 are rural stations. The Alaska Rural Communications Service (ARCS) television distribution system, for which there is no market-driven substitute, passes on EAS and PBS-AWARN alerts to broadcasters in rural and urban communities via satellite. EAS and PBS-AWARN require state funding. Without television, viewers in rural areas would not see or hear EAS or PBS-AWARN alerts at home on their over-the-air TV sets. Bush radio listeners in communities served by translators fed by the satellite system would lose that distribution channel. Radio listeners with only one station would lose local and regional EAS access. Television stations in Anchorage, Mat-Su, Kenai, Juneau, Fairbanks and Bethel would lose access to ARCS as a listening assignment, weakening EAS and PBS-AWARN capabilities. When the FCC approves a new digital broadcast transmission standard ATSC 3.0., this funding will allow public broadcasting in Alaska to leverage new technologies that allow transmission of life-saving digital information to police, fire and first responders. The Corporation for Public Broadcasting (CPB) is the federally funded nonprofit organization that funds PBS and 1,500 locally owned and operated public television and radio stations across the country — like Alaska Public Media — with the purpose of educating, entertaining and inspiring the American people, unencumbered by political or commercial imperatives. The federal funding for public broadcasting represents 0.01 percent of the federal budget. Federal investment in public broadcasting accounts for just $1.35 per citizen per year. This crucial seed funding allows public media stations to raise more funding locally and pays huge dividends to millions of Americans and their families. Federal funds help Alaska Public Media provide television programs like PBS KIDS, PBS NewsHour, FRONTLINE, MASTERPIECE and Nature, as well as national radio programs from NPR and other providers like Wait Wait… Don’t Tell Me!, This American Life, Morning Edition and Marketplace. These funds are also used to create local radio programs like Alaska News Nightly, Talk of Alaska and Line One. Congress ultimately decides whether public broadcasting continues to receive federal funds. The elimination of federal funding to CPB would initially devastate and ultimately destroy public media, ending important work in early childhood education, public safety, connecting citizens to our history, and promoting civil discussions for Americans in rural and urban communities alike. The $445 million in federal money provided to public broadcasting is vital seed funding for America’s independent public media stations, particularly for public television stations in rural America and those serving underserved populations, where federal funding counts for 40-50 percent of their budget. A recent bipartisan national survey found that a majority of voters — including 82 percent of independents, 62 percent of Republicans and 83 percent of Democrats — support federal funding for public broadcasting. Additionally, public media has traditionally had bipartisan support in Congress. Public television provides more than 120,000 trusted learning tools and free resources for teachers, parents and caregivers to use in the classroom and at home, reaching 40 million children across the country. As the No. 1 source of children’s educational media, public television is America’s largest classroom. Research shows that children’s shows such as Daniel Tiger’s Neighborhood, Super Why! and Peg Plus Cat teach important skills, such as social-emotional skills, early literacy and math. Alaska Public Media offers free, over the air PBS KIDS 24/7 — an all-day & night educational kids channel. Public television reaches 68 percent of all kids ages two to eight, providing educational media that’s proven to prepare kids for school, especially low-income and underserved children who do not attend preschool. Public television is the only non-commercial television network available for free to all Americans, whether or not they have cable TV. More than 200 million Americans connect through more than 350 public television stations, the web, mobile devices, in the classroom and at in-person events. Public television provides trusted, family-oriented programming for all ages that does not include violence or sexual content. Public television is a smart investment. At a time when schools are cutting funding for music and art, public television helps keep the arts alive for children and adults.